The Friday lunch series continues. Today we tried Revolution, a Chowhound-endorsed spot in downtown Durham. A few weeks ago I signed up for the Revolution Lunch Counter emails. Every Tuesday, I get the week's lunch selections. It is a short, but well thought out selection of a special soup, salad, pasta, fish and meat dishes. And there's always a Mexican selection, which us what drew me in today. I am a sucker for steak and guacamole, so the Kobe Beef Fajitas with spanish rice, mango salsa, roasted guacamole and cilantro crema had my name all over it. My lunchmate wanted to try the cream of broccoli soup with truffle oil with crostini. I'm glad he did and agreed to my request for two spoons. It was a huge bowl of creamy deliciousness, full of flavor and not overpowered by the swirl of truffle oil. To our waiter's surprise, we ordered two glasses of the Falanghina to sip while we waited. According to him, "Most people don't drink at lunch." Clearly these people have not done lunch with the Dawnville team. Usually I like to order two different dishes at a new restaurant to get an idea of the offerings, but neither of us could resist the fajitas. We both dug in heartily. The Kobe beef was cooked medium-rare and tender. The combo of the savory onions and peppers, cool mango salsa and creamy guacamole made a perfect bite rolled in the toothsome corn tortilla. The rice was very flavorful with a fine couscous-like grain. We ran out of tortillas before we finished the healthy portion of fillings, but the separate ingredients stood up on their own. I couldn't resist a peek at the dessert menu. While I was pleasantly full after my lunch, but apple crisp is one of my favorites. Revolution's version is constructed like a muffin with a crispy, crumbcake topping and a rich, dense apple filling. While finishing dessert, we perused the dinner menu and were intrigued by the chef's tasting menus. There are three tiers with three-, four- or five courses. The chef creates the menu on the spot for your table. Sounds fabulous. Revolution is a modern restaurant that manages to present style and substance. Can't wait to see what's up next for lunch. Paris in Durham? Mais oui! and the requisite moules frites for Miss G.
Close your eyes and you could be on the left bank. Tonight we had the good fortune to find ourselves free for a dinner out. Little G was playing with a friend, and when we tried to retrieve her around dinner time, she was having too much fun to head home. Never ones to look a gift horse in the mouth, we took the opportunity to try a new place (new to us anyway). Across from our beloved Neal's Deli sits Glasshalfull, a Tapas Bar/Restaurant/Wine Bar/Wine Store. As you can see from the description, there seems to be a bit of an identity crisis, which may have been a reason for our reluctance to try it out. All I can say is that I am sorry that I wasted 17 months in Chapel Hill without dining here. The restaurant has a great energy and interior space that is open and inviting . Exposed, distressed brick walls and warm lighting give the space an urban vibe that belies the Carrboro location. There's a large patio for outdoor dining in the warmer months. We arrived fairly early, around 6:15, and decided to sit at the bar vs. a table. The bar is large and horseshoe-shaped, with a large granite counter, perfect for spreading out the small plate selections. 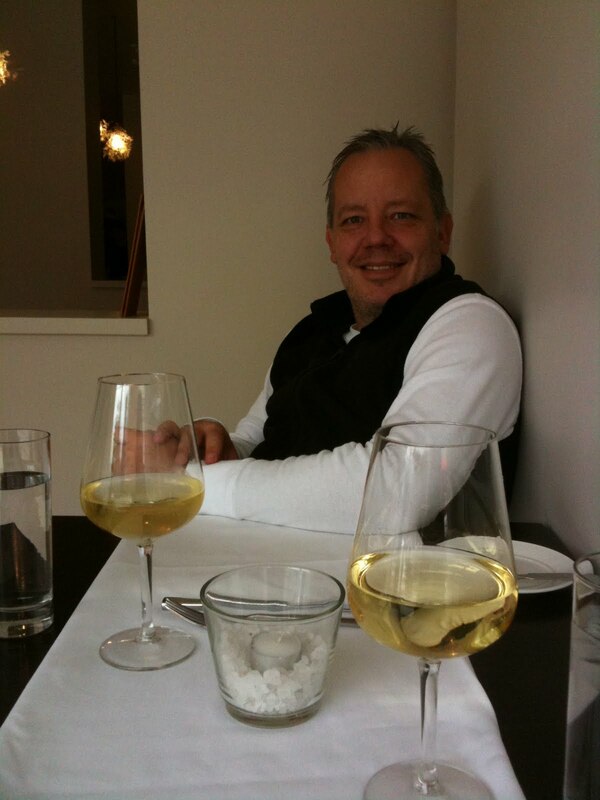 The wine list is on the front of the menu, which indicates the seriousness of the owners about beverages. I spotted a J Vineyards rose champagne by the glass and Big G ordered a Girodano prosecco. One of the things I liked about the wine service was that you could order the wine in 3 oz. or 5 oz. pours, giving you the opportunity to taste lots of things. After settling in with our bubbles, we started to peruse the menu which offered tapas specials, small plates and large plates. Having been treated to delicious dim sum by our neighbors earlier in the day, we were happy to have an assortment of small bites to chose from. Note to self: small bites quickly become big meals if you eat enough of them. More on that later. Initially, we ordered wild mushroom croquetas and jamon serrano from the tapas special menu. 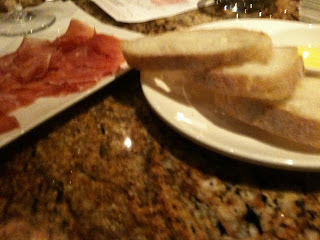 The jamon serrano was silky smooth and porky without being too strong. 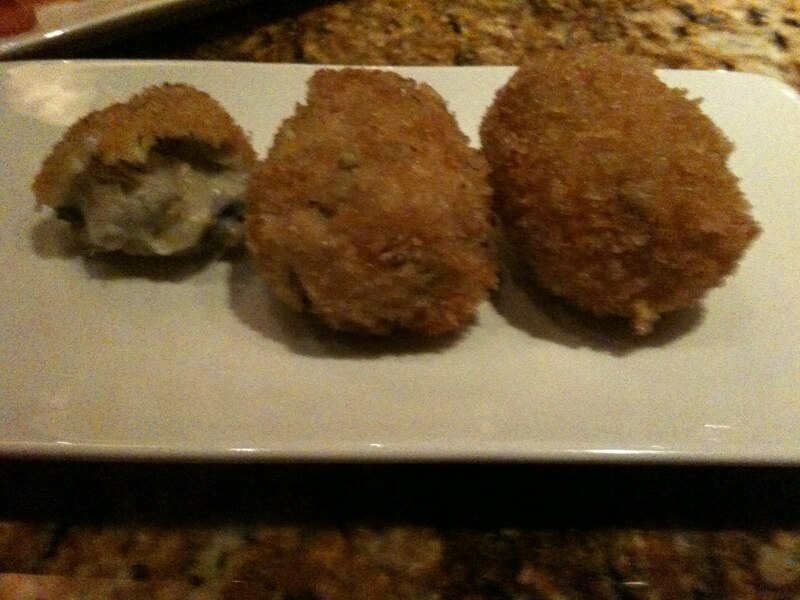 And how can you go wrong with mushrooms and bechamel coated with breadcrumbs and deep-fried? Answer: you can't. Warm, gooey and delicious about sums it up. As we were deciding on the next round, I noticed the cocktail selection on the back of the menu. 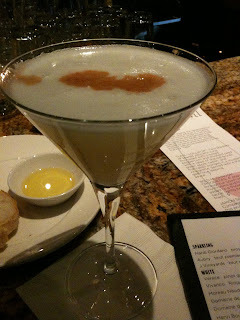 I literally gasped with delight when I saw Pisco Sour on the list. I love this frothy, sweet and sour, ethereal Peruvian concoction. I rarely see it on menus, so I had to have one. Never mind that it probably wasn't an appropriate pairing with the seafood tapas to come. It was delicious. One of the best I've had. We sampled an intermezzo of tuna lollipops, also part of the tapas menu. 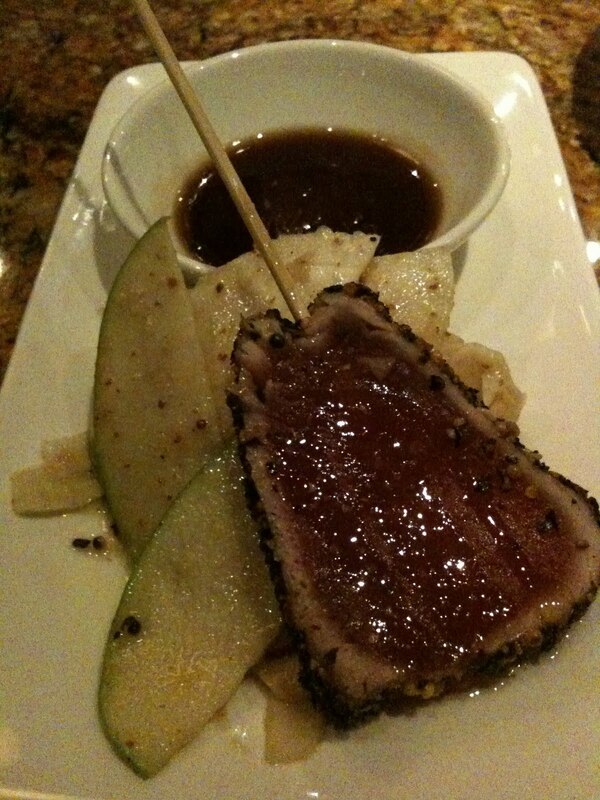 The ahi was perfectly seared and crusted with black and white sesame seeds and served with a sherry dipping sauce. The tangy salad of fennel, apple and radish in a mustard dressing was a tart, tasty complement to the delicate flavor of the fish. OK, here's where the small plates turns into a big feast. 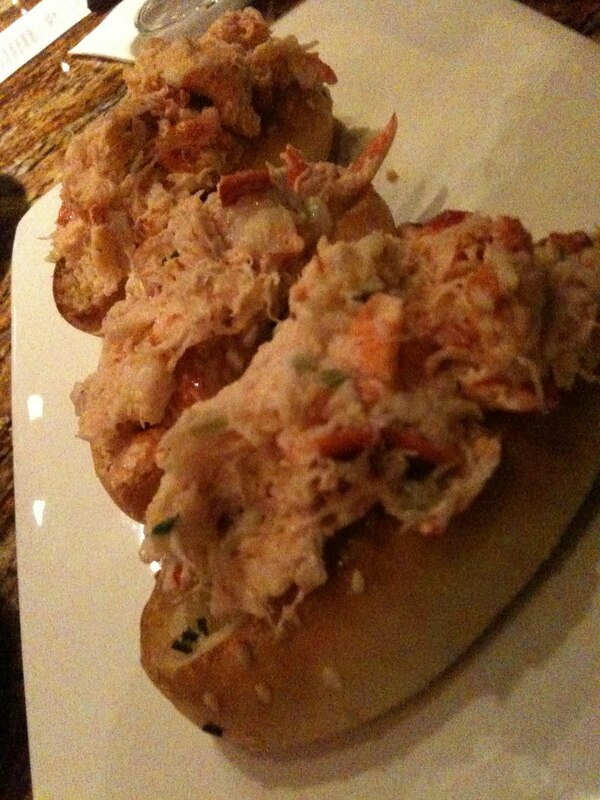 Who could resist a trio of mini-Maine lobster rolls. I admit that I am a sucker for small food, but really what evokes summer, in the middle of winter, more than a lobster roll? Maybe not if you're from Nebraska, but on the eastern seaboard this is a no-brainer. And to go with the lobster, fries of course. With a four-herb seasoning. The fries were the skinny French frites variety, Very well prepared and tasty. Now at this point, a reasonable person would have stopped. But my neighbor at the bar ordered the cheese plate. I was not in the mood for dessert, but cheese, that's a different story. And to be fair to the restaurant, we had to take a look at the dessert menu. The profiteroles filled with coffee cream caught our eye. They came drizzled with caramel sauce and hazelnuts. Ridiculously good. Many places serve stale pastry with store-bought ice cream, doing a great disservice to one of the great, simple desserts of all time. Not here. Every element was as it should have been, combining into satisfying bites of tender pastry, rich cream, sweet caramel and crunchy nuts. I liked them all, but loved the contrast between the Mahon and the quince. I sampled the cheese with a Clos Saint Vincent St. Emilion. Chatting with the bartender at the end of our meal, we learned that the chef is a CIA graduate and studied in Spain with Ferran Adria, the chef associated with the molecular gastronomy movement. And following up with a little research of my own at home, I learned that he is only 25. I think he has a great future ahead of him and hope he's in North Carolina to stay for awhile. Seriously, this is one of the best start-to-finish dining experiences we've had since arriving in Tarheel country. It's a versatile dining experience that you can make your own. Stop by for a quick drink and some tapas, a full dinner, or dessert at the bar. and two glasses of Macrina verdicchio. As you know, I get excited about a new restaurant the way that normal people do about a new puppy or a trip to Cancun. What can I say, eating is my passion. And while some may disagree, I think it is a noble pursuit. After all, I am like a medieval food tester. I save you the trouble of eating dreck and instead point you to the good stuff. I happened to spot a mention in our local rag, The Raleigh News & Observer, about the opening of Kitchen in Chapel Hill. As I scanned the blurb I saw that it was located in Midtown Market, a mere stone's throw from my door. I quickly did an online cross-reference of my favorite foodies and discovered that Kitchen is a new bistro in town. It may be the only bistro. And as it turns out, that's alright with me. es frites. Two, steak frites. Three, polenta pound cake. Unfortunately it was early afternoon and I would have to wait until after work to head over and sample the wares. Thankfully, my family is game for these adventures and looks forward to them as much as I do. beloved Foster's Market as well as a new bookstore, so that may help get the word out. In any event, once you walk inside, you forget about the humble exterior. We were greeted warmly and ushered to a table on the long end of the L-shaped dining room. The room is painted a warm yellow with a touch of gray. the tables and chairs are black as is the small bar. The high ceilings give the room a larger feel. I loved the linen dishtowels used as napkins. As some of you know, one of my favorite spots is Barbarella in La Jolla, California. It is a delightful neighborhood restaurant with reasonable prices where you can drop in at any time for a salad, pizza or full meal. The atmosphere is casual and convivial but the food is prepared with a careful hand. I always look for this type of restaurant in my travels and near home. Kitchen, although currently only open for dinner (but at 4 which makes it a possibility for a late lunch), may be this type of spot for me. I was anxious to dig in, so I gave the menu a cursory glance to refresh my memory from the online version. Truth be told, I knew I was going for the mussels. While my husband, Georges, makes the best moules frites ever, it is a time-consuming enterprise and not one that he has time to undertake very often. From what I could see, Kitchen has already attracted a loyal following. There were repeat customers and also couples and colleagues meeting at the bar for an after-work bite. We ordered an grenache blanc and a prosecco to sip while we waited for our appetizers. I decided on the chopped salad ($8, blue cheese, beets, walnuts) Georges the vodka and beet-cured salmon with sweet and sour cucumber salad (pictured above, $9), and Giselle the sweet and smoky almonds ($4). For entrees, Georges went for the steaks frites ($18), I couldn't resist the moules frites with thai red curry ($12) and Giselle decided on four-cheese ravioli with a kalamata olive tapenade ($11). Before the appetizers arrived, we were brought a plate of fresh french bread and olive oil for dipping. One nice touch was the salt and pepper sprinkled on the plate so that you could dip in the oil and then dip in the salt and pepper. Never seen it done that way before. Also never had my frites served in an old-fashioned metal measuring cup, but it was cute. So how was the food? Really, really good. In bar parlance, many people have a local. The neighborhood spot that you go to time and again because it feels good. Kitchen could become our local. The thai red curry was so good that I was eating it with my spoon after the mussels were gone. Giselle demolished the ravioli and we even ate the frites, which is saying a lot for the van Hoes who use Georges' frites as the standard by which all others are judged. The fries weren't as good as his, but they were a stand-up representation. You would think that there would be no room for dessert, but you would be wrong. With all that went before being so delicious, we had to go for it. Georges and Giselle shared the dark chocolate almond torte ($5), a luscious, rich slice of heaven. At least I think so, because it disappeared without my being offered a bite. I had to try the toasted polenta poundcake ($5). It was served with blueberries and a lemon cream. The cake itself was not too sweet, and the berries and cream balanced it nicely. We paired the cake with a half-bottle of sparkling moscato. Pleasantly full and pleased with our discovery, we headed home with thoughts of our next visit in our heads. After all, we need to try the burger, the sauted calamari and the housemade merguez, oh my. It was the best of Charlotte and the worst of Charlotte. That sums up my two dining experiences in the Queen City last weekend. We were off to rendezvous with Grandma and our cousins. I approached the trip with few dining expectations based on the fact that we would be in group dining situations. Few people are as dedicated to the pursuit of good food as I. Without so much as a consultation of the Triple D website, Giselle and I cruised down to Charlotte with our culinary future uncertain. As usual, we arrived hungry. Thankfully, Grandma was hungry too. We had passed the Stonecrest shopping center on our way in and spotted a Dean & Deluca store which seemed a harbinger of good dining possibilities within the center. As we drove around, I spotted Cantina 1511, a Mexican restaurant I remembered from a previous Chowhound search. 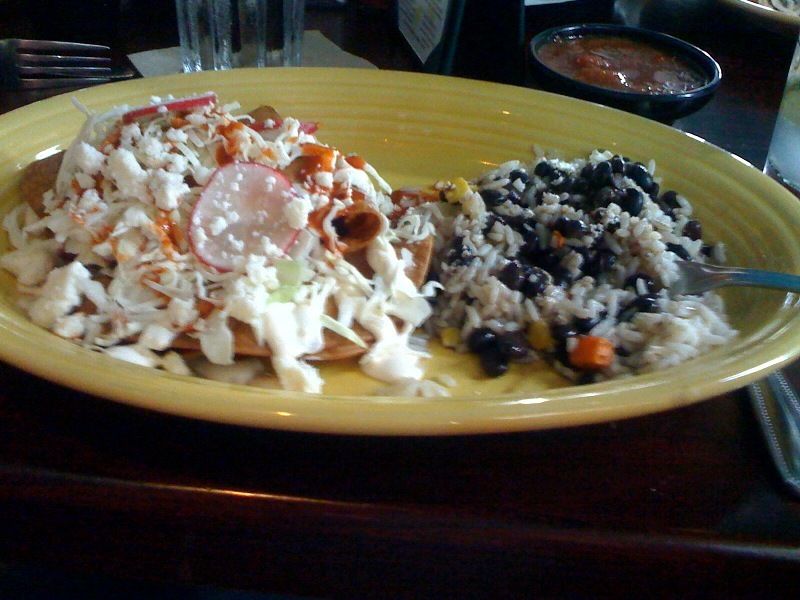 While usually skeptical of any east coast Mexican, we decided to give it shot based on the excellent reviews. I believe this is the second location of this local favorite, the first being in Uptown (Charlotte's confusing name for its downtown area). We entered through heavy wooden doors into a large space divided into a bar/lounge area and the main dining room. Our waitress led us to a table by the window, but it was too hot and sunny to open the wooden shutters. Still, it felt like we were on a terrace, if not in Mexico, also not like a strip mall. Drinks, a peach mojito for Grandma and a house margarita on the rocks for me, arrived quickly. Both were a hit. There was an extensive cocktail list and at least 10 different margaritas. I would definitely return for happy hour with a designated driver. On to the main event. 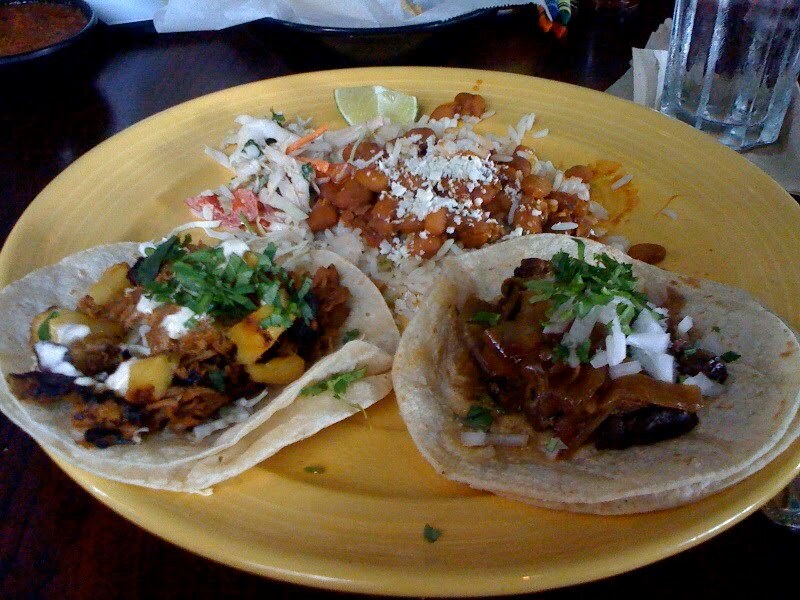 The menu is divided into two sections "Authentic Mexican" and "TexMex." I appreciated the distinction and thought that this was a promising sign for the food that was to come. The server informed us that the chef had just returned from Oaxaca, Mexico, where he makes frequent trips to study the cuisine. I found it odd that there were no Oaxacan moles on the menu, but that's a minor quibble. 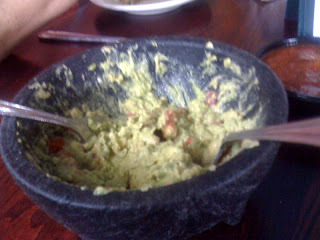 We ordered guacamole to start. They make it tableside! And, Giselle got to be the sous chef on the preparation, too cute. The result was delicious and she will now have a new job at future fiestas at Casa van Hoe. Giselle ate so much of the green stuff I thought she might be ill. It was so tasty and fresh it was hard to stop. The accompanying salsa was good too, with just enough bite to be interesting without tuning off folks who don't like spicy food. Once I saw the Tacos al Pastor on the menu, I knew what I would have. I ended up with a combo plate with one of the al Pastor tacos and a carne asada taco, plus rice and charro beans. Giselle ordered the kids chicken soft taco and Grandmas went with a plate of crispy tacos with shrimp and crab. After our meals arrived there wasn't much talking, just happy eaters. While the coconut flan and cuatro leches cake were tempting, I was too full to partake. I look forward to another trip to Charlotte for an excuse to revisit Cantina 1511. Now to the dark side of the Queen City, and not just because of the threatening storm clouds. On Sunday, our group went out in search of southern seafood and soul food. I had heard about a place called Mert's Heart and Soul in Uptown, so we drove 20 miles from the Ballantyne area to check it out. The importance of the drive will come into play later. We had to drive around Uptown a bit to find parking, but it gave us a chance to see the heart of Charlotte. The Bank of America tower is a centerpiece of the skyscape. Discovery Place was humming with inquisitive children, and we also drove by the Harvey Gantt Center for African American culture. For those with a love of loud cars, the NASCAR Hall of Fame is nearby too. Plenty to occupy an afternoon. We were all pleasantly surprised by Mert's. It was a cute little place with red walls adorned with family photos and old record albums. The food smelled and looked good on the plates we glimpsed going by. Even though they were busy, we were seated immediately. So far, so good. I love supporting independent restaurants and was excited to see this one doing so well. Here's where the story turns ugly. We waited 10-15 minutes for a server to come over (I'm being generous here.). We gave her our drink orders and lunch orders at the same time since time seemed to be an issue. After another 15 minutes, we got our drinks. Fifteen minutes after that, we got a piece of cornbread. I will be fair, the cornbread was excellent. Moist, buttery and piping hot. But notice, we are 45 minutes into our visit already. We have two hungry children with us. Not going well. And, the table behind us had complained to the manager about the delay and they came in after we did! At the one-hour mark, food arrived at our table. Not all the food that we ordered, but some. Giselle had fried chicken with collard greens and mac-and-cheese. She went straight to work on it and seemed to enjoy it. Our young cousin received his pancake, but not the accompanying eggs or turkey sausage. My cousin received her full order, but the turkey sausage was raw in the middle. My mother did not receive anything. I think you can see where this is going. After repeated attempts to flag down a server to bring some syrup for the pancake, we finally got some. I was waiting to dig in until my mother got her food. When asked, the server said it was coming. About 10 minutes later, a plate arrived. It was neither the right type of fish nor the correct side items. And I will add that it was a whole catfish. Some people don't mind a whole fish. My mother is not one of them. The gaping catfish mouth put her over the edge. Now it was time for the manager. Let me say that this guy was a hustler. I saw him in the kitchen plating orders in between seating customers. He was very apologetic and after some discussion he decided to comp our entire check. I think this was good customer service and showed respect for our displeasure. I can honestly say this was the worst experience I have ever had in a restaurant, and you know, dear reader, that I dine out quite frequently. That being said, I would give Mert's another chance sometime in the distant future once the memory fades. I have to believe that our experience was an anomaly. Otherwise there is no way they could stay in business. So there you have it. I look forward to a return visit to Charlotte for shopping, museum hopping and a return trip to Cantina 1511. And I still need to try those Diners, Drive-Ins and Dives spots like Dish. When you work at home every day, you sometimes forget that the outside world exists. Especially in the winter, it's easier to stay snug in your warm cocoon rather than venture out. It's easy to lose track of time as well. So at least once a week, I like to go out to lunch. And in a new area, there are lots of spots to explore. My neighbor celebrated a birthday recently so I invited her to lunch. After mulling over our choices, we decided to try somewhere new to both of us, Lime and Basil, on West Franklin in downtown Chapel Hill. In California, my officemates and I used to go to Pho Nam every week to satisfy our craving for that fortifying bowl of Vietnamese soupy goodness. Lime and Basil serves pho (pronounced "fuh") as well as plate lunches. It was cold that day, so I went with the pho. Whatever ails you, pho will help. Basically, it's a bowl of rich, flavorful broth to which you can add your choice of a variety of meats including eye of round, brisket, flank steak and Vietnamese meatballs. I chose the eye of round and the meatballs. The steaming bowl of broth, meat and rice noodles arrives at your table accompanied by a plate of crunchy beans sprouts, basil and jalapenos for garnish. There are also a variety of sauces, one similar to hoisin, Sriracha and chile garlic to season the pho to your liking. Everything tasted very fresh and the meat was high-quality. In my experience, there is no elegant way to consume pho. Just let yourself go and slurp your way to sheer delight. Just watch your clothes. I have been known to go with the old-man look of the napkin tucked into my shirt to avoid the inevitable splashes. If you're not feeling like pho, Lime and Basil also offers grilled lemongrass pork, chicken and shrimp lunch plates served with rice or noodles. My neighbor tried the pork and pronounced it very good. For an economical, tasty lunch, I recommend Lime and Basil. Note: It's a fairly small spot so you might want to get a table before noon. Dawnville is all about the pursuit of good food and good times, which for me are inextricably linked. I am passionate, but not political about the food I eat. I think sense of place is often found on a plate. So come along for the ride and discover the pleasures of the plate at home and on the road. I love food and travel. People always ask me where to go and what to eat so it makes sense to blog about it. I am an eater and creator of food. I have loved hotels since I was a little girl. You will enjoy this blog if you understand going to three (or more) different stores to shop for a single meal; if a good farmers market seems like Disneyland; and driving an hour or two for dinner seems like a rational idea; and you can spend untold hours researching the perfect hotel for your summer vacation or even a business trip. You are my people. If this doesn't describe you, read anyway. Maybe you'll pick up a tip or two.